During Spring and Summer abandoned ducklings for one reason or another sometimes find themselves separated from their mother and the rest of their brood. They have been taken by a predator which has been spooked or bullied for their prize lunch and has then dropped the little duckling who has managed to flee. They have been washed into a douit or other water hazard and not been able to get out. The mother and / or father have been killed by a predator or run over by a car. They have been separated from their mother during the hazardous walk along Guernsey roads to find water. The most common reason we are called out to rescue our little feathered friends is because they have been separated from their mother on their first trip from the nest to find water. Often they will have a long and potentially hazardous walk following the mother duck to the nearest water, sometimes a mile or two from home, along main roads walking in and out of the traffic! In most instances the separation is temporary and if left they will be reunited and continue on their journey. If however the mother duck does not return or is spooked then it is best to call for help. 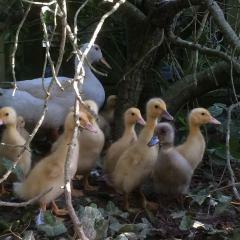 Every year our ACO and voluntary wardens have both been called to rescue ducklings from Douits. On those occasions the ducklings had often fallen into the Douits and the strong running water has forced the ducklings against a grating where they can be too tired to get away and if left they are not rescued would eventually drown. Thankfully often the ducklings are rescued and make it to the Shelter. Keep your distance, keep the babies protected and wait to see if the mother returns – this is usually within half an hour. If she doesn’t return then you can put them in a safe box and bring them to the GSPCA or call the Shelter on 257261 and we will send somebody out to help. It is a common sight to see a mother and ducklings around Guernsey at this time of year. If you do come across a mother duck and her young while driving please slow down and if necessary shepherd them calmly across a danger point, such as a busy road, to a safe spot. Unfortunately we have already had reports this yer where uncaring drivers have purposely ran over ducklings in the road. Often mother ducks nest away from water and then lead their ducklings to water soon after hatching. This often involves going through built up areas and crossing busy roads to get to the water. If you do try to help a mother duck and her family across a road please be aware you can easily frighten them. If they do become frightened then the ducklings will scatter around and the mother is likely to fly off. However, it will help the birds if the traffic is directed when they are trying to cross a road and this may also prevent accidents. Slowly and carefully herding the family group to water is probably most effective. However, if they mother and young are separated, the ducklings can be put in an open-topped box and left until the mother returns. When she does the ducklings should then be gently released from the box so that the family are back together as a group. The mother will keep an eye on you and will only return when she believes you are at a safe distance. Please remember that in most in cases it is best to leave a duck family alone. The mother duck will know where she is going and is best placed to rear her young. If you are ABSOLUTELY SURE that the ducklings are orphaned or abandoned then please contact our 24 hour emergency line 01481 257261. In the meantime, however please keep the ducklings contained, warm and dry and NEVER put them on water without their mother. 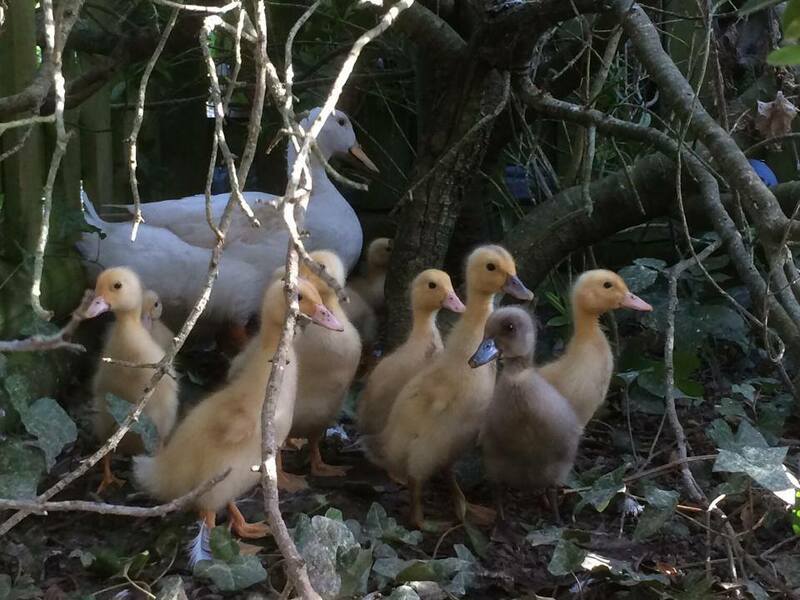 Did you now that ducks and ducklings are the second most popular species that the GSPCA rescues with an average 100-200 birds a year. 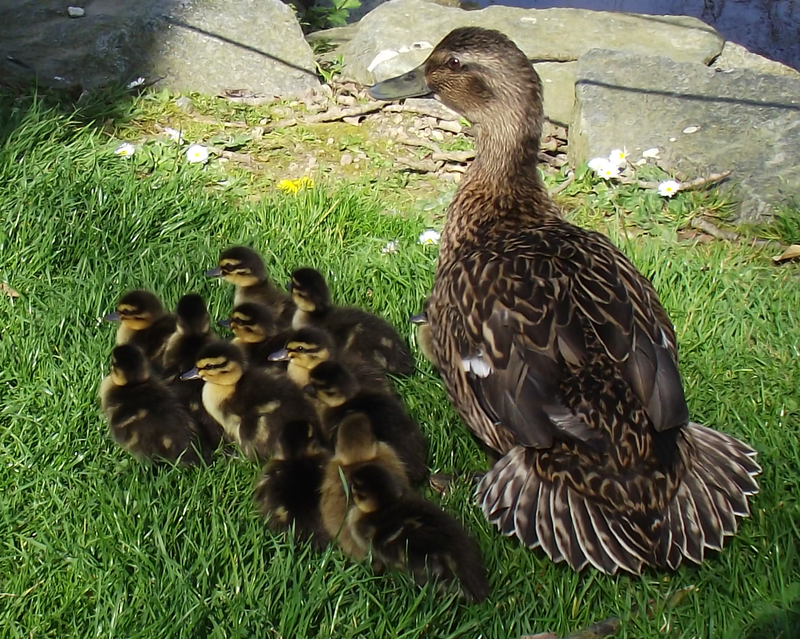 During the Summer months the GSPCA often have 30 to 50 ducks and ducklings in our care. Ducks have large broods of young as sadly they are predated on by other species of animals which rely on them as a food source for themselves and their young. Currently the largest brood of ducklings recorded was 24 in Arundel, Sussex from a Mallard mother earlier this year. A Mallard has an average clutch size of 8–13 eggs, which are incubated for 27–28 days to hatching with 50–60 days to fledgling. Ducklings are precocial and fully capable of swimming as soon as they hatch.